HB Chris Carson vs. Titans Run Defense – The running back taken with one of the last five picks in the 2017 draft, Chris Carson, has become one of the NFL’s most elusive running backs through two weeks. In Week 1, Carson was given six carries and forced three missed tackles. That performance earned him 20 carries in Week 2 and he forced another five missed tackles for a total of eight in the running game, tied for third among running backs, and an overall running grade of 83.0 which ranks second among all running backs. In his Week 3 matchup, Carson will face a Titans run defense ranked 25th by PFF that has given up 154 of 208 rushing yards after contact for an average of 2.9 yards after contact per carry. Meanwhile, the 3.12 yards after contact per carry figure averaged by Carson is the fourth most in the league through two weeks. 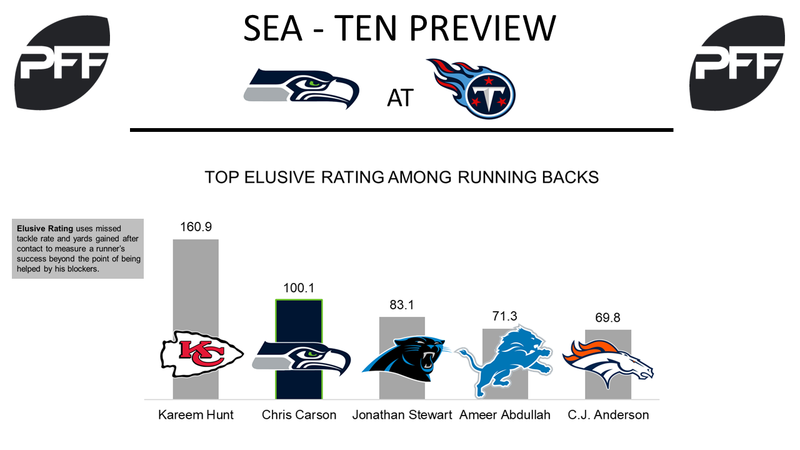 Seattle Tackles vs. Tennessee Edge Rushers – Starting left tackle Rees Odhiambo and starting right tackle Germain Ifedi have combined to give up 16 of the 33 total quarterback pressures surrendered by the Seahawks’ offensive line. In Week 3 they will face a unit of edge defenders that ranks 28th by PFF in pass-rush grade and has seen their edge rushers create nine of the team’s 22 total quarterback pressures and were only able to generate three in the first week. Quarterback Russell Wilson’s passer rating with 2.5 seconds or less to throw increases from 72.0 (24th) to 92.5 (11th) when given 2.6 seconds or more to throw. WR Doug Baldwin vs. CB Logan Ryan – Doug Baldwin has run 58.3 percent of his routes from the slot and has seen five targets when lining up there, catching all five of those targets for an average of 1.64 yards per route run from the slot, seventh among wide receivers. He will likely line up against cornerback Logan Ryan who has seen five targets thrown his way while in slot coverage and has allowed four receptions, two touchdowns, and a passer rating of 154.6. Baldwin has yet to score from the slot, but his four touchdowns in 2016 were tied for sixth most among wide receivers in the slot in 2016. 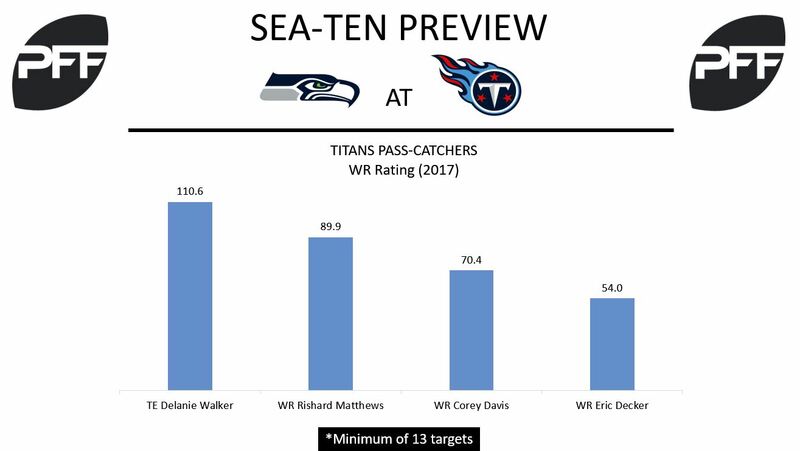 TE Delanie Walker vs. Seahawks Safeties – Through two weeks, Titans tight end Delanie Walker is at the top of his position with a PFF overall grade of 90.8. 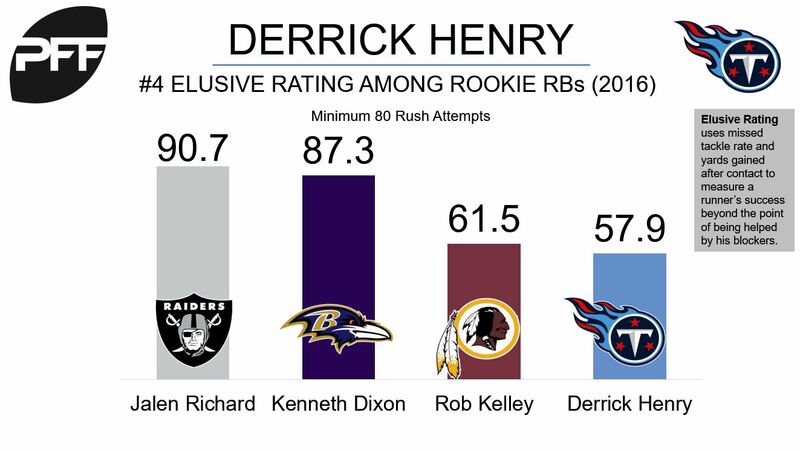 He averages 2.69 yards per route run, which is third for his position. A lot of his damage is inflicted out of the slot, where he’s caught six passes for 79 yards. Seahawks safeties Kam Chancellor and Earl Thomas will likely provide Walker with his toughest matchup to date. Thomas ranks fourth among safeties with .04 receiving yards allowed per coverage snap, while Chancellor is sixth at .07. Chancellor has allowed just one catch for five yards on four passes thrown in his coverage. Thomas has relinquished three catches on three targets for three yards. T Jack Conklin vs. EDGE Cliff Avril – While Tennessee Titans right tackle Jack Conklin’s PFF run-block grade of 83.6 ranks ninth among tackles this season, his ability in pass protection has been a different story. Conklin’s pass-blocking grade of 35.7 ranks 62nd out of 69 qualified tackles, and his pass-block efficiency of 91.8 is 50th. Although he’s allowed eight total pressures, none was a sack or a hit. This week, he’ll see a heavy dose of Seahawks edge defender Cliff Avril. In 2016, Avril ranked ninth among edge defenders with a pass-rushing productivity of 12.1. This year, he’s off to a slow start with only two total pressures and a pass rushing productivity of 3.6. HB Derrick Henry vs. LB Bobby Wagner – With Titans starting running back DeMarco Murray dealing with hamstring tightness, there’s a chance Derrick Henry will receive a bulk of the carries against the Seahawks. He made the most of his opportunity in last week’s matchup against the Jaguars. He ranked fourth among running backs in Week 2 with an elusive rating of 99.5, and his 4.64 yards after contact per attempt also ranked fourth. Linebacker Bobby Wagner leads the Seahawks with six run stops and a run-stop percentage of 13.6. Seattle has allowed 25 rushing yards on 14 carries against sets with two or three tight ends. Tennessee has 36 carries for 160 yards out of those sets.